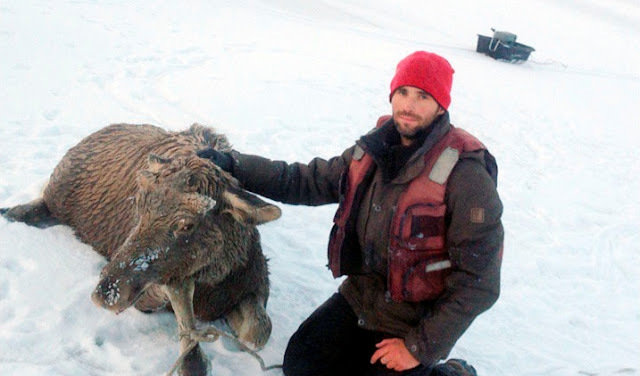 White Wolf : Russian man rescues young moose calf stranded on a icy lake. 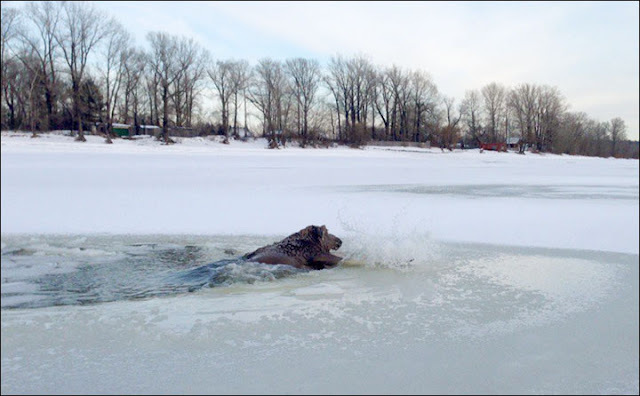 Russian man rescues young moose calf stranded on a icy lake. Barnaul angler Ivan Drachev, 33, caught more than he bargained for when he noticed an animal fallen through the ice. He went fishing for perch in the frozen Ob River when saw movement in a distant ice hole. Fearing a fellow angler had fallen in, he skied over to check. 'Half way there, I realised that this was not a man but an animal. I came closer and saw a young moose,' he said. 'It fell through right in the middle of the channel, where the depth is about 1.5 - 2 metres. 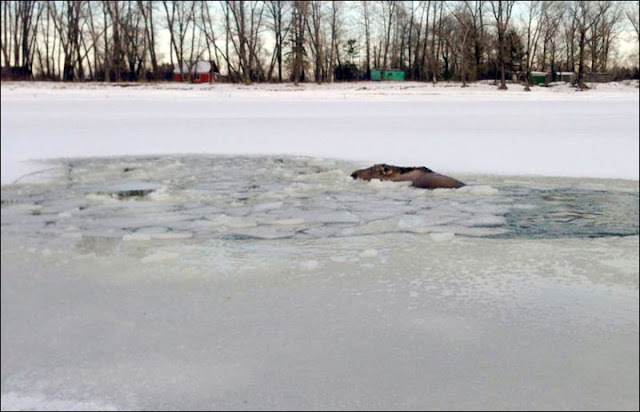 'It floundered there for about 40 minutes, the ice hole was already very big, but it was clear that the it got cold. It swam to the ice edge and put its muzzle onto the ice. He called his wife and asked her to call the emergency services, but they made clear they do not deal with animal rescues. 'I had two options - to drag the moose or to hack a passage to the shore. When my father arrived, we decided to try the first option. I made a lasso and managed to throw the rope around the neck of the animal at the third attempt. I tried to do it so the animal didn't choke. 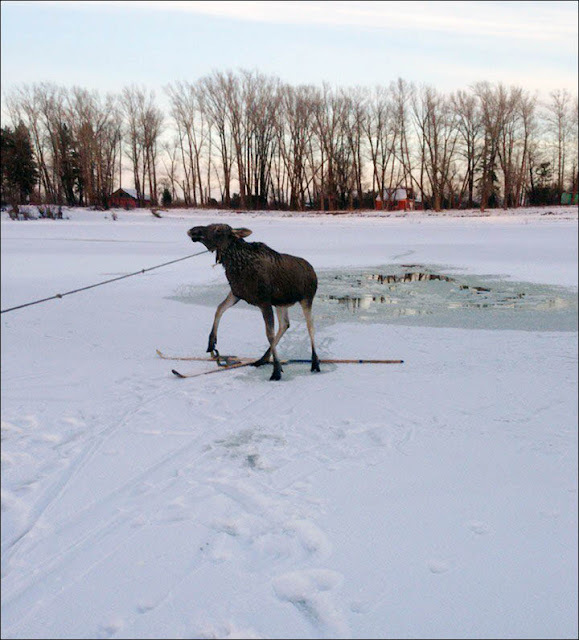 'We began to pull the moose. 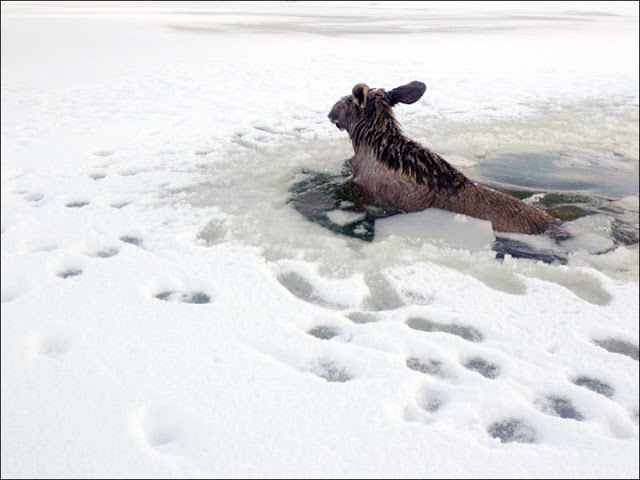 Luckily, it turned on its side and got its front hooves on to ice, so we dragged it for about 20 metres. Then it fell through again closer to the shore, but there was not deep, and we pulled it out easily. He took the rope off its neck and tied one leg instead. His reward was unexpected gratitude from the wild animal as he got a moose smooch. 'The moose calmly lay down and was trembling,' he said. 'For 30 minutes, we were trying to somehow rub it to warm it up. The moose had no convulsions, it was just shocked. 'It was funny when I sat down next to it and it put its muzzle on my knee. That was just a simple cow, but it seemed that it understood everything. In wildlife this animal is rather dangerous, but here it understood that we had dragged it out of danger - and not for burgers. 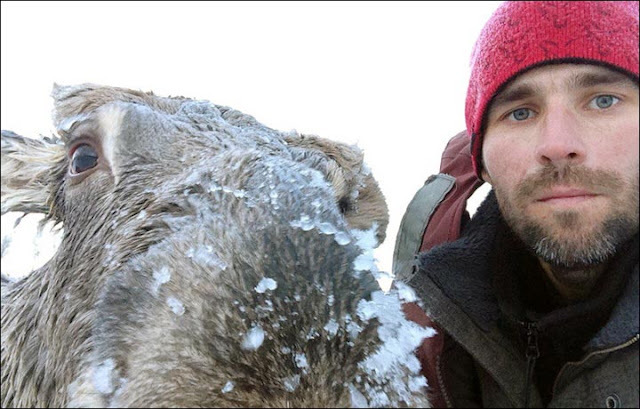 Responses to "Russian man rescues young moose calf stranded on a icy lake." Thank you to this dear young man and his father. They saw a fellow creature in dire need, and rescued her. THANKS for their compassion and for their courage. Men like these are the true heroes. Well done to save this young bull calf.